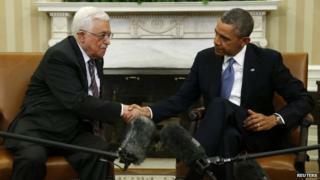 US President Barack Obama has told Palestinian Authority President Mahmoud Abbas he must take "risks" for peace. Mr Obama told reporters at the White House that the search for a two-state solution remained elusive but he hoped to see progress in the coming weeks. Mr Abbas said he considered the current round of talks a historic opportunity. The US wants both sides to approve a "framework" accord that would extend the negotiations beyond next month's deadline for a final deal in July. But Palestinian officials say the prospect is "disappearing day by day". Mr Obama and Mr Kerry brought the Israelis and Palestinians back to the negotiating table last July after a three-year hiatus, and said at the time that their objective was to achieve a "final-status agreement over the course of the next nine months". Although negotiations have taken place in secret, there has been little sign of progress and US officials say they are now trying to forge a framework that "narrows the gaps" on core issues and allows the process to continue beyond 29 April. The issues include the borders between Israel and a future Palestinian state; the status of Jerusalem; Israel's insistence that it be recognised as a Jewish state; the Palestinians' demand that their refugees be allowed to return to their former homes in what is now Israel; and security in the West Bank, with Israel wanting a long-term presence in the Jordan Valley. At the start of his meeting with the Palestinian leader on Monday, Mr Obama said: "We are going to have to take some tough political decisions and risks if we're to move it forward." "My hope is that we can continue to see progress in the coming days and weeks," he added. Mr Abbas said he was hopeful that the Israeli authorities would release a fourth batch of 26 long-term Palestinian prisoners by 29 March, in line with a deal that saw the talks resume. "This will give a very solid impression about the seriousness of the Israelis on the peace process," he said. Israeli ministers said last week they would have difficulty approving the release if an agreement was not reached to extend the peace talks. Before Mr Abbas's visit to Washington, an official at the Palestine Liberation Organisation (PLO) said its negotiating team felt it did not "have a partner on the Israeli side". The pan-Arab newspaper al-Hayat meanwhile reported that at his meeting with President Obama, Mr Abbas would demand that Israel halt all construction at Jewish settlements in the occupied West Bank as well as the release of high-profile Palestinian prisoners as a condition for agreeing to extend the peace talks beyond 29 April. Sources were cited as saying that the prisoners would include Marwan Barghouti, a Fatah leader serving multiple life sentences after being convicted of murdering Israelis, and Popular Front for the Liberation of Palestine leader Ahmed Saadat, jailed for 30 years for his role in the assassination of Israeli Tourism Minister Rehavam Ze'evi in 2001. Two weeks ago, Mr Obama told Israeli Prime Minister Benjamin Netanyahu that a peace deal required "compromise on all sides". While offering no concessions in public, Mr Netanyahu insisted: "Israel has been doing its part and I regret to say that the Palestinians have not." Mr Netanyahu is insisting on Palestinian recognition of Israel as the nation-state of the Jewish people, but Mr Abbas has refused. The Palestinians recognise the State of Israel, but say recognising its Jewish character would have implications for Palestinian refugees and Israeli-Arabs.